In Google’s Webmaster Central blog, the Feb 26th entry is titled, Finding More Mobile-Freindly Search Results and contains information about algorithm changes that will take place beginning April 21, 2015. Starting April 21 we will be expanding our use of mobile-friendliness as a ranking signal. This change will affect mobile searches in all languages worldwide and will have a significant impact in our search results. Consequently, users will find it easier to get relevant, high quality search results that are optimized for their devices. Will I Rank Worse If My Website Is Not Mobile-Ready? Which Websites Will Be Effected Most By This Change? Of course this is only one of over 200 ranking signals, but only Google knows how much weight they will put on this particular ranking signal. Seems to me like it might get more and more important as the worldwide trend toward mobile continues to grow. The reason for this change is simple. Websites that aren’t mobile ready (also known as “responsive”) may not render well on mobile devices like smart phones and tablets. In Google’s attempt to provide a good user experience, it makes a lot of sense for them to return search results that render properly on your mobile device. So, while you may not see an immediate dip in traffic to your site when the algorithm goes live April 21, it would be smart to get ready for the transition by updating your site to be mobile. This is just one more reason why we recommend a custom-coded website vs. a theme website, which may not be coded to be mobile-ready. 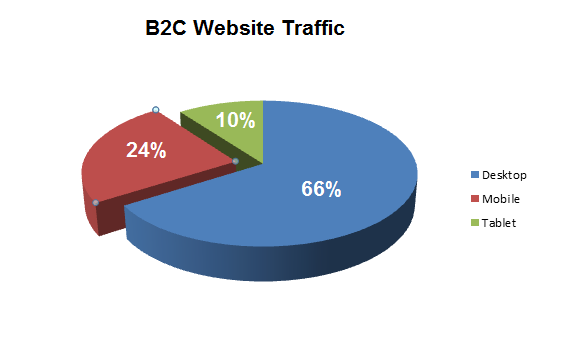 Clearly, businesses in the Business-to-Consumer (B2C) market will be effected more than businesses in the B2B niche. The charts below represent Google Analytics data from several websites in each niche. 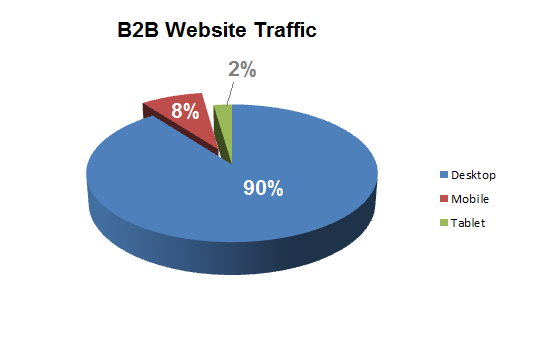 The B2B niche is expectedly much lower, with mobile traffic representing only 8% of all website traffic. As most people work from an office, it only makes sense that desktop would dominate the chart below at 90%. Find out if your website is mobile ready by watching this short video, includes examples. And this video will show you how to use Google analytics to find out how much traffic your website is getting from mobile devices. Either way you look at it, mobile is the present and the future, especially for those businesses that serve consumers. All of our new website design projects are coded to be responsive, so your site will scale to any mobile device now or in the future. We offer mobile-friendly web design services that set you up for success on any sized mobile device. If you’re site is not mobile-ready now, it would be wise to consider an upgrade in the near future, as it is clear that Google is taking this seriously and your traffic may suffer.